A modern look you can customize to your heart's content! "Almost Mrs." prints in the font shown in your choice of color. Background and wording are printed in your choice of colors and fonts. Personalization Options: "Almost Mrs." is printed as shown in your choice of color. Background and wording are printed in your choice of colors and fonts. I have loved Anns Bridal Bargains! I have gotten my save the dates, bridal party invitations, and also our wedding invitations! So wonderful! Great quality at such affordable prices! I love them all. Thank you Anns Bridal Bargains!!!! 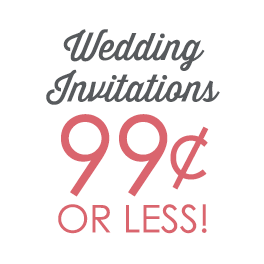 Beautiful invitations and at an amazing price! These were perfect for my daughter's Bridal Shower. She loved them and I got several compliments on them. Thank you for your offering of these.